I’ve talked before about biopics and how they’re not exactly my favorite genre. I mean, I know they can be done well, but I’ve noticed that they all seem to follow a very simple set of rules. So the idea that Amadeus takes is a fascinating one: not simply the fact that it focuses on Mozart, but the idea that it looks at Mozart’s life from the perspective of a man who hated him. What makes this movie work is the fact that it focuses on both Saleiri and Mozart. But besides that, It would have been easy to make Mozart a dignified hero and Soleiri a diabolical plotter. Or the other way around. But in fact, what director Milos Forman does ensure that both sides of the story get some place in the limelight. Although to be fair, this may have quite a bit to do with F. Murray Abraham and Tom Hulce, both of which give wonderful performances. Special credit goes to Abraham who draws your eye no matter what he’s doing. I also like how the story is told in flashback, and the scenes with the older Soleiri ‘confessing’ his story are wonderfully executed, and the editor knows exactly the right place to insert them into the main story. What can be said about this movie that hasn’t already been said? The writing. The production design. The sound design. The MAKEUP, for goodness sake! 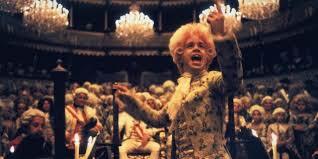 And the way that Mozart’s music is woven in and out of the film is just beautiful. This movie is a spectacle to behold. It’s one of the best, it might even be THE best, and I plan on revisiting this one many times in my future. Lovely movie! .I like your approach in reviewing it. I visited Mozart’s home and museum in Salzburg, Austria, and saw a presentation of his life- a very young genius, and this movie captured most of it .